ABUJA - President Muhammadu Buhari has again stayed away from the regular Wednesday meeting of the Federal Executive Council. This would be the third time the president would, in a row, miss FEC. Though official reasons for his non appearance at today’s meeting were not given as at press time, what is public knowledge however is that the President is sick and on medications. An official statement from the State House last week had said that the president was recuperating in a private residence. But on Tuesday (yesterday), a glimpse of hope shone when the Attorney-General of the Federation, AGF, Abubakar Malami and the Group Managing Director, GMD of the Nigerian National Petroleum Cooperation, NNPC, Mailkanti Baru emerged from the Presidential wing and briefed State House correspondents on what transpired in their respective private meetings with the President. Speaking to newsmen after such meetings was not the favourite of both men. They have had to wave and smiled at Journalists who beckoned on them for interviews on coming out from the Presidential wing of the State House in the time past. Apparently, this known culture was what pulled a surprise in the estimation of many. Similarly, the Wife of the President, Aisha Buhari the same day said in a tweet that her husband was not as sick as perceived, saying he has continued to performn his responsibilities. 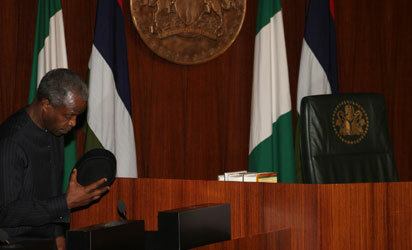 At exactly 11 am, he called for recitation of the national anthem to signal the commencement of the meeting. Thereafter, he called the Minister of Federal Capital Territory, FCT, Mohammed Bello and the Minister of Budget and National Planning, Udo Udoma for Muslim and Christain prayers respectively. Then, Journalists were excused from the meeting.